Multiple Myeloma, Lymphoma, Leukemia, Breast Cancer, And Nutrition. 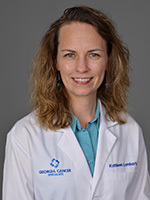 Dr. Lambert is a member of the American Society of Hematology, American Society of Clinical Oncology, and Georgia Society of Clinical Oncology. In medical school, she was awarded the Susan J. Mallette Memorial Oncology Research Award, and in fellowship, she was awarded the Barton Haynes Early Career Transition Award. Prior to joining Georgia Cancer Specialists in 2013, she was on faculty at Duke University Medical Center for four years. In her spare time, she enjoys tennis, running, cycling, and traveling.